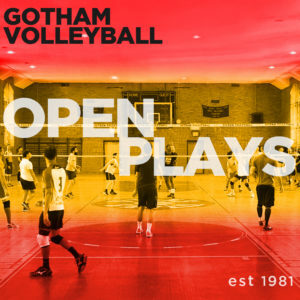 Gotham members volunteering to coach teams in lower divisions is one of the things that helps make Gotham Volleyball great. Most teams that play on Saturdays, and some weekday teams, have a volunteer coach working with the team. Our volunteer coaches not only add a layer of skill development and a crucial pair of eyes that a captain needs, but also an important element of moral support. Coaches push a player to try harder and, when the player tries and fails, offer encouragement and support. Coaches are volunteers in Gotham, and the level of involvement with the team depends a lot on the preferences of the team captain. Once a coach is paired with a captain, the details of the role could be helping to create a line-up, devising and implementing pre-game drills and warm-ups, in-game coaching (calling time-outs and giving feedback to players), and possibly post-game encouragement. A coach should help players identify the skills needing focus and development. A coach should also be able to monitor team dynamics (before, during and, possibly even, after play) and take action to remedy situations that occur during a match. In many respects, the captain is the leader of the team; however, a good coach makes it possible for a captain to succeed. If you are interested in volunteering as a coach this Fall, please fill out the form using the link above. For those interested in coaching, we will make every effort to pair you with a team at the level of your interest. If you have any questions, e-mail [email protected].